Advent has begun once again. We have returned from our Thanksgiving travels and the Christmas lights are twinkling throughout the house. I have retrieved my Advent devotionals from their spot on the highest shelf in our bookcase and here I sit once again with my computer and my bible in my lap pondering the mystery and meaning of Advent. Longing. Waiting. 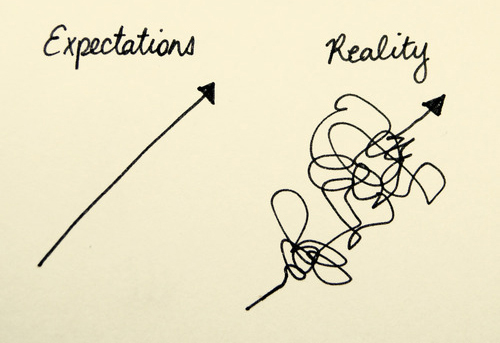 Expectation. Mystery. The words of Advent. Uncomfortable words in our hurried, instant gratification world. With Siri at the ready to answer any question with the push of a button and Amazon available to deliver almost anything to our doorstep overnight, we are disgruntled when we are made to wait. We are a take charge, get ‘er done, easy answer society and we see waiting as a problem to be solved, not as an invitation to be still. Let’s do this thing called Christmas! I know, I will start a list! When my girls were younger, I remember the news December 1st had arrived evoking a sense of trepidation and anxiety. I wanted their Christmas season to be PERFECT! Thank you, Jesus, there was no Pinterest when my children were little, but the pressure was still real to make their Christmas magical, meaningful and memorable. Every year, I had big plans for Advent wreath devotionals and Hallmark worthy cookie baking sessions, in addition to an exciting and spiritually meaningful countdown to Christmas morning magic. All of this, of course, would be beautifully and carefully orchestrated by their Christmas sweater wearing, Advent devotional reading, “Jesus is the reason for the season” reminding, Christmas treat baking, holiday party throwing, Christmas pageant organizing, charity food basket giving, sparkly light hanging, calm, cool and spiritually mature mother. The only problem was I seemed to be the only mom available. In the 12 step program, we often say “expectations are the seeds of resentment.” Every year, I would set myself up with expectations for orchestrating the “perfect” Christmas for my family. And every year, I found myself slightly disappointed by the things I had left undone. I have spent many Advents with good intentions of “doing it right.” Daily devotions and bible readings, quiet reflections on the meaning of the Nativity, lovely entries in my journal reflecting the profound insights that I have experienced from God. Then, because it doesn’t quite happen that way, I have a vague sense of discontent on the 26th that I somehow failed to experience the Christmas of my expectations…that I somehow “missed” it. Don’t get me wrong, disciplines such as these are wonderful and I treasure the times during December when I have the opportunity to experience those kinds of quiet moments. But, I am coming to understand that these types of expectations for Advent really just put that focus back on me (instead of God)…what am I doing to orchestrate, manufacture, invoke a Christmas “moment?” Just like the perfect Christmas experience I tried to create for my children, am I trying to “birth” Christ in me through my own busyness…my own preparations…my own efforts? Here is the good news for all of you moms out there with your heart pounding as the realization of December’s arrival sets in. I never once delivered a “perfect” Christmas for my children and yet they both still love Christmas and they understand Jesus is the reason for the season. Like all aspects of their childhood, God took my messy, mixed motives and my clumsy attempts at faithfulness and created something beautiful and holy. Perfectly imperfect and, like the loaves and fishes of long ago, just enough. Maybe God doesn’t need me to orchestrate the message He has for me or my family this Christmas. Maybe God has a plan for which He doesn’t need my help. Maybe my part is to grab those quiet moments when I can, but to realize that God is equally present in those wilder, louder, crazier, busier moments. Perhaps we should prayerfully remain open and surrendered to the serendipitous gifts of Presence we may experience through no efforts of our own, if only we are watching for Him as we wait. Perhaps we might all be better served by letting go of our expectations of how we should “do” Christmas and expectantly wait for God to show us how He “does” Christmas. I am finding that, when I let go of my preconceived notions of who God is and what He can do, He shows Himself to be bigger and better than I could even imagine. The first Christmas certainly shows us that He is a God that defies conventional expectations!! Are you ready for the unexpected this Christmas?! How do you balance the expectations and realities of living Christmas for real? Wonderful post…and look at the simple/humble setting in which Christ came into the world…glory can certainly happen in the context of simplicity. Thanks for sharing your Christmas experiences. Thanks for stopping by the blog! Simplicity is the key, isn’t it? Merry Christmas to you and yours! Beautiful post. This Christmas will be less than perfect from the outside looking in, but will be Christmas none the less. It’s always nice to know we are not the only one. “Always nice to know we are not the only one.” Isn’t that the truth? The power of Me Too!! Thanks for stopping by the blog! Merry Christmas to you and yours. Quiet moments, unplanned joy, whispers of love, unexpected snuggles- its Jesus. Thanks for another great post!